Quiet, clean home with a perfect location! Close to EVERYTHING! Property 3: Quiet, clean home with a perfect location! Close to EVERYTHING! Property 19: Pet-Friendly Woodlands Townhouse Near Market St.
Property 27: HIDDEN TREASURE (Heart of The Woodlands)- Estate Sleeps 14. Property 28: Lake Houston Vacation Home, Breathtaking Views, Floor to Ceiling Windows. Property 29: Relaxation in The Woodlands you say? Thistle Dew Cottage is your place to stay! The Tree House - Comfy Home - Prime Location - Close to Everything Woodlands! Property 33: The Tree House - Comfy Home - Prime Location - Close to Everything Woodlands! Property 42: Fantastic house in The Woodlands - with Pool! NEW! Upscale Woodlands Townhome - 1.5 Mi to Dwtn! Property 45: NEW! 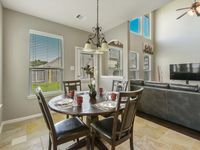 Upscale Woodlands Townhome - 1.5 Mi to Dwtn! Property 49: NEW! Spacious Conroe Home w/Foosball & Pool Table! This is a recently remodeled house with plenty of room. It's right near a well known grocery store. We were there 4 days. The landlord was quite responsive to questions. We were in town to celebrate a &quot;milestone&quot; birthday for my brother-in-law last weekend. The house was perfect. Clean, neat and lots of room. A total of four couples stayed there. Didn't have to worry about drinking-and-driving. The kitchen was great, and there were plenty of bathrooms. It is also near local shops and grocery stores. Best of all, it was right around the corner from their home! We had a great time and will rent again! Thanks!